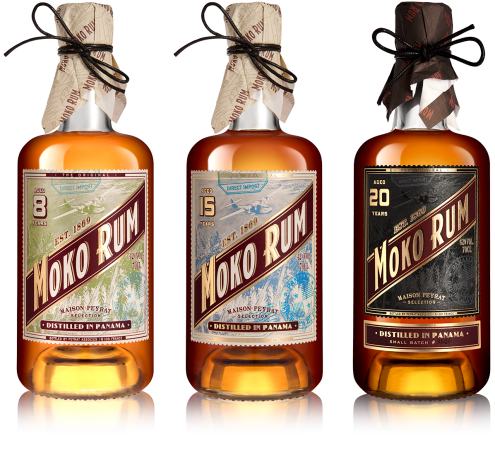 In 1869 two brothers from Bordeaux, Ernest and Maurice Lasserre, decided to create their own brand of rum: “MOKO”. 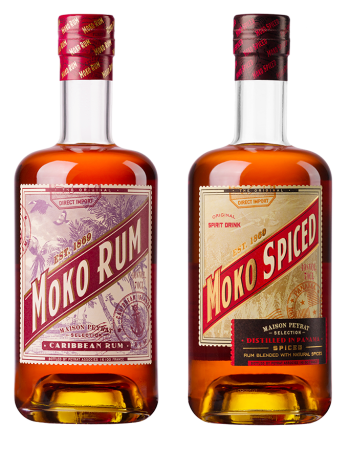 The brothers emphasized quality and tradition when selecting rums imported from Martinique and Jamaica for MOKO. They perfected techniques of distillation and aging to produce a superior, more satisfying drinking experience. Their rums quickly enjoyed great success, collecting numerous awards and medals. However, in the 1960s production and distribution ceased. In 2017 connoisseurs of great rum can rejoice in the rebirth of MOKO RUM. Philippe Peyrat and his children, Clémence and Edouard—the direct descendants of Ernest Lasserre—are using their long experience in wines and spirits to resurrect MOKO, updating the methods used by their forebears in the creation of great rum. The amber-colored hues, the nose offers delicate notes of exotic fruits, coconut and toasted almonds. The mouth roundness reveals a pleasant sensation of freshness. Fairly strong vanilla, nutmeg, cinnamon, caramel, and allspice bouquet.. This aging imparts a round mouthfeel and an unparalleled smoothness to the rum. With its honey-colored hues, MOKO RUM reveals aromas of vanilla oakiness, caramel and maple syrup that are complemented by woody notes touched by macadamia and a pepper finish. Expressive aromas gradually display notes of cardamom, vanilla and tea. Several seconds of aeration reveal hints of dried coconut heightened by a touch of spiciness. In the mouth, a bewitching roundness offers exceptional satisfaction to delight connoisseurs of quality rum. A delicate caramel bouquet first entices the nose, then evolves to rare aromas of vanilla, oak and intense tobacco. The robust and complex structure reveals a rich perfume of figs, bourbon and grilled nuts culminating in notes evoking fine Cognac. The rums are aged for several years in Panama to achieve maturity, then imported at their full, natural alcohol level to preserve aromatic richness. In the cellars of Maison Peyrat they are held for several months in oak casks previously used for aging Cognac to impart an incomparable elegance and greater roundness in the mouth.